Looks like whatever the security firms do to catch up with them, the cyber criminals manage to go one step head. Amidst ransomware threats making headlines in past few weeks a new type of threat has emerged. When one just thought that cybercriminals were only interested in hacking websites, stealing passwords, etc., it looks like they have moved on to a new field of interest, which is Internet of Things (IoT). In other words, if you own a Smartwatch, Smart TV, Smart fridge, or any Internet-connected smart device, you may want to be careful. Trend Micro researchers have come across an Android mobile lock-screen ransomware, known as ‘FLocker’, which is capable of locking Android smartphones as well as Smart TVs. Yes, you have heard it right! Echo Duan, a Trend Micro researcher wrote in a blog post that ever since FLocker (detected as ANDROIDOS_FLOCKER.A and short for “Frantic Locker”) version came out in May 2015, more than 7,000 variations of the malicious ransomware have been traced by the company. 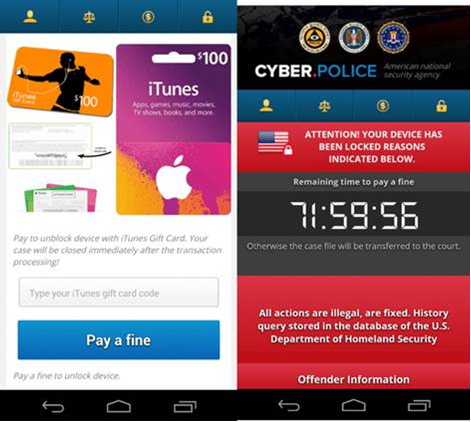 The FLocker ransomware initially targeted Android smartphones with its developers continuously updating the ransomware and adding support for new Android system changes. “This is the first major instance of ransomware to infect TVs that we’ve found,” Christopher Budd, global threat communications manager, told SCMagazine.com in an email. According to the report, its author kept rewriting the malware to prevent detection and enhance its routine. “Over the past few months, we have seen spikes and drops in the number of iterations released. The latest spike came in mid-April with over 1,200 variants,” said the company. This FLocker operates as a police Trojan and attempts to scare the potential victim into paying by claiming to be the US Cyber Police or another law enforcement agency. Once the malware is downloaded and the TV locked, the hacker accuses potential victims of crime they didn’t commit and demands $200 in iTunes gift cards to have the Smart TV or mobile device unlocked. Ironically, the very convenience the owners obtain by using multiple devices that run on one platform makes life easier for the hackers. “Using multiple devices that run on one platform makes life easier for a lot of people. However, if a malware affects one of these devices, the said malware may eventually affect the others, too,” Duan wrote. “As far as how, it’s being delivered through standard infection vectors: nothing new or special. The TVs in this case are accidental collateral damage of the ransomware, and not specifically targeted. They just happen to be running an attackable version of Android.” Budd said. There is little difference between FLocker that attacks mobile devices and the version that goes after Smart TVs. “To avoid static analysis, FLocker hides its code in raw data files inside the “assets” folder. The file it creates is named “form.html” and looks like a normal file. By doing so, the code of “classes.dex” becomes quite simple and no malicious behavior could be found there. Thus the malware has the chance to escape from static code analysis. When the malware runs, it decrypts “form.html” and executes the malicious code,” he wrote. Trend Micro says the malware is configured to deactivate itself in some regions including Russia, Bulgaria, Hungary, Ukraine, Georgia, Kazakhstan, Azerbaijan, Armenia, and Belarus. However, if FLocker detects devices outside these countries, the malware will wait for 30 minutes. After the short waiting period, it starts the background service which requests device admin privileges immediately. If the user denies the request, it will freeze the screen faking a system update. The ransom webpage fits the screen, irrespective if it infected a mobile device or a smart TV. Even though the new variant of FLocker does not encrypt files on the infected device, it has the capability of stealing data from the device, including contacts, the phone number, device information and location data. While Trend Micro’s report is not clear as to how FLocker infects smart TVs, it does mention that typically ransomware infection arrives via SMSes or malicious links. Therefore, you should be cautious while browsing the Internet, and receiving text messages or emails from unknown sources. Next time your Android smart TV refuses to play, you should know your are in for a big ransom.